You have access to the most robust reporting system in the industry. A comprehensive set of financial reports and useful reports is included. While specialized reports for property portfolios and owners provide you the most relevant data quickly and easily for your clients. All reports can be emailed, printed, or exported to PDF or Excel. 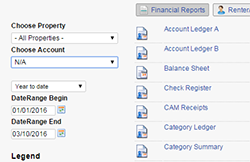 All your data can also be synchronized with Quickbooks to provide a familiar format to CPAs and bookkeepers. Rentec Direct also provides most reliable tenant screening reports.